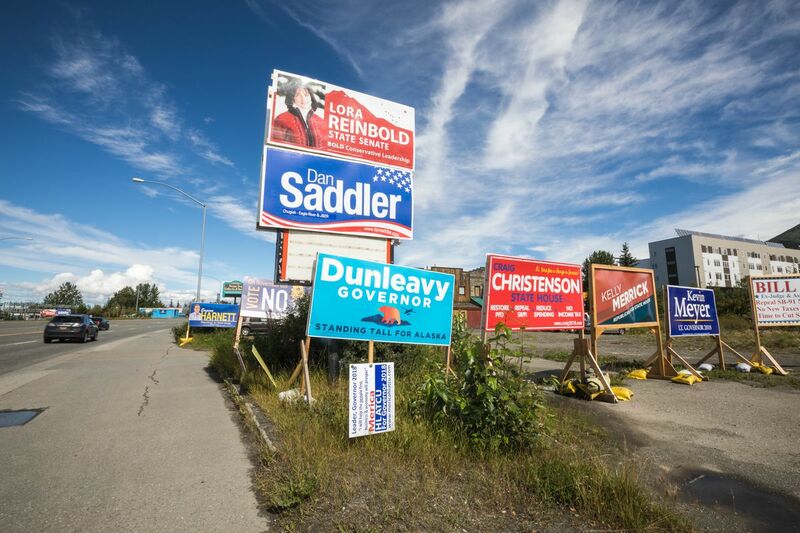 The Alaska Department of Transportation seized more than two dozen political campaign signs in Anchorage last week that officials said were illegally placed along state roads and causing safety hazards for drivers. With the clock ticking to the Aug. 21 primary election, the DOT's move sparked protests from candidates and campaign officials, who described the enforcement as unprecedented and unfair. They also questioned the timing, with Gov. Bill Walker up for re-election this fall. No Walker signs were seized in the sweep, according to a state inventory. The Walker campaign said it received no advance notice or special treatment but spotted orange tags on the signs and reacted quickly to move them. 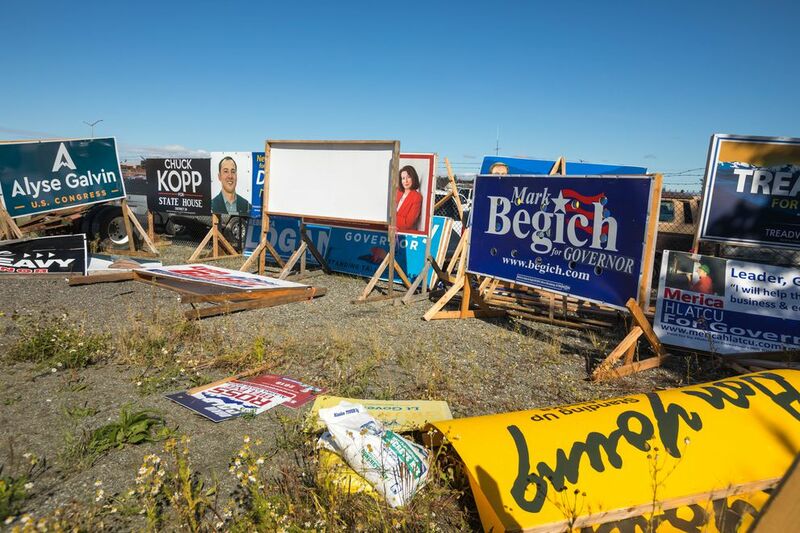 DOT spokeswoman Shannon McCarthy said the sweep was motivated not by politics but by a "proliferation" of illegal signs on state roads, despite state and federal laws against outdoor advertising in Alaska. Because of budget cuts, those laws have been little enforced in recent years, though sweeps used to happen more regularly, McCarthy said. She said the department had heard a barrage of complaints from the public this summer, though she didn't have an exact tally. The state sent a letter to candidates in the spring about right-of-way laws, McCarthy said. On July 23, the state announced through a KTVA-Channel 11 news story that it would be inspecting state roads for illegally placed signs. Two days later, DOT workers placed orange tags on 200 to 250 signs placed illegally in the state right-of-way across Anchorage, McCarthy said. Of those, about 50 posed "immediate safety concerns," McCarthy said. McCarthy said one stretch of Abbott Road near Dimond Boulevard had 22 signs that were interfering with sightlines for drivers. Another problem area was the intersection of Raspberry Road and Jewel Lake Road, McCarthy said. A DOT website on campaign signs says signs can be removed from the public right-of-way without any notice. On private property within 660 feet of the nearest edge of the right-of-way, signs can't be installed or positioned so the message can be read from the state roadway, said Heather Fair, the statewide right-of-way chief. Fair said that's an uncomfortable part of the law to enforce, and DOT generally sends a letter to the property owner and asks them to remove problem signs voluntarily. Most comply, she said. 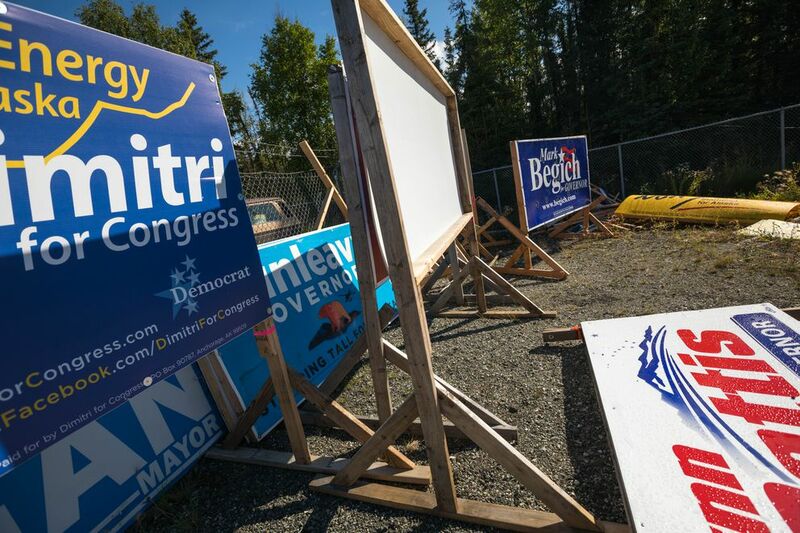 On July 30, DOT workers picked up the 30 remaining campaign signs in Anchorage that the department had labeled as safety hazards. It cost the state $3,600 to do the removals, said Tom Grman, DOT superintendent for Anchorage maintenance. In all, DOT collected 28 signs from 14 Republican candidates and seven signs from four Democratic candidates, according to an inventory requested by Anchorage Daily News. Edie Grunwald, a Republican candidate for lieutenant governor, had four signs removed, more than any other candidate, according to the state inventory. Amanda Price, Grunwald's campaign manager, said that to her knowledge, the campaign had not received advance notice of the sign removals. She said Grunwald was a "staunch rule-follower" but had not been expecting the state's action, based on its past enforcement patterns. "We expect the state to enforce those rules equally and consistently, not on a whim during a challenging primary campaign," Price wrote in an email. "It creates questions of why now." Signs are expensive — hundreds of dollars for a large sign — and candidates see them as an important way of signaling campaign activity. Brett Huber, the campaign manager for Republican gubernatorial candidate Mike Dunleavy, who had three signs removed, questioned whether the enforcement was being applied fairly, and if Walker signs were removed. "This is a longstanding tradition balancing the DOT regulations with specifically private property owners," Huber said. "This is the most aggressively I've ever seen it handled." State officials and the Walker campaign said there was no relationship between the sign crackdown and the governor's re-election bid. "We are not using the Department of Transportation to take down signs," said John-Henry Heckendorn, who is Walker's campaign manager. "I hope that's intuitive." Bob Walker, Gov. Walker's brother and the self-described "statewide sign guy" for the campaign, said he noticed the orange tags and immediately drove around and picked up the signs. Bob Walker said the campaign was one of the last to join a crowded stretch of signs on Abbott Road and Dimond Boulevard, and he'd placed signs there during past campaigns without a problem. Bob Walker said the campaign didn't want to take chances. He also said the Walker campaign may have benefited from three lawyers in the family who knew how to read the law. "It turned out we responded quicker than the others — c'est la vie," Bob Walker said. "But there was no advance knowledge. Nobody gave us a secret phone call. None of those things. We were just out there." Mead Treadwell, another Republican candidate for governor, also had a sign removed. The sign was in the right-of-way, said campaign manager Mike Robbins. He said the campaign received a letter about the enforcement but the campaign's sign manager was in Fairbanks and couldn't get back in time. Robbins said he recalled threats of fines, not the actual removal of signs, in the past. He said he too questioned the timing, but said the sign controversy was a "distraction" from Treadwell's opponents' records. The signs that were seized were hauled to a maintenance yard at DOT, where they will be stored up to 30 days. After that, the signs will be destroyed. Campaigns can pick up the signs, and pay a fee, which run at least $50 per violation. Fair, the state right-of-way enforcement officer, said her office sends letters every year to candidates about decades-old federal and state laws regulating the placement of campaign signs. All candidates received the same notice and treatment from the state, Fair said. "DOT is not interested in limiting free speech, period," Fair said. "However, we are charged with enforcing the law, federal and state." In 1998, voters in Alaska overwhelmingly supported a ballot initiative to forever ban outdoor advertising on all state roads, Fair said. There are some exceptions, she said, like business signs. Beyond the initial roundup, orange tags still mark dozens more campaign signs around Anchorage. Those signs may be subject to removal, McCarthy said. She said the DOT has hired three short-term staff to help with right-of-way management, including signs, though she said those workers haven't started yet. This week, 179 campaign signs were tagged in the Mat-Su that posed safety problems, McCarthy said. She said the state would be acting "soon" to remove them. "We just got to a tipping point where we really had to let the candidates know we would be going out there," McCarthy said. ADN photographer Loren Holmes contributed to this story. Correction: A previous version of this story incorrectly stated the title of John-Henry Heckendorn. He is not a employee in Gov. Bill Walker's office. The story also misspelled the last name of the DOT superintendent in charge of maintenance. He is Tom Grman, not Tom Gorman. Heather Fair's title was also incorrectly listed as state right-of-way enforcement chief. She is the statewide right-of-way chief, and does not do any enforcement.